Julie Dobrow visits Gibson's to talk about the extraordinary lives of Mabel Loomis Todd and her daughter, Millicent Todd Bingham, and the powerful literary legacy they shared in editing and publishing the first volumes of Emily Dickinson’s poetry and letters, in After Emily: Two Remarkable Women and the Legacy of America's Greatest Poet. Mabel’s complicated relationships with the Dickinsons—including her thirteen-year extramarital affair with Emily’s brother, Austin—roiled the small town of Amherst. Mabel and Austin’s love led to her work with Emily Dickinson’s poetry, which inspired both Mabel’s life and her daughter’s, and fed controversies over the poetry’s promotion, editing, and ownership. 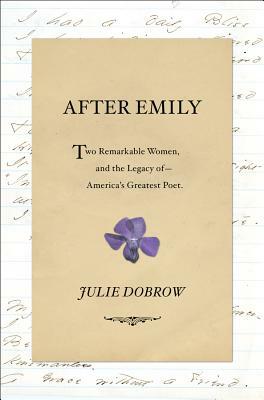 After Emily is based on extensive primary source research, as Julie Dobrow unearthed hundreds of never-before-published primary sources including hidden diaries, long-lost letters, photographs and scans of original manuscripts to tell the stories of these two women who pushed up against the edges of their time, and reveal the surprising impact Mabel and Millicent had on the Emily Dickinson we know today. About the author: Julie Dobrow is a professor with appointments in the department of Child Study and Human Development and the Tisch College of Civic Life at Tufts University and serves as director of the Center for Interdisciplinary Studies. Her writing has appeared in Boston Globe Magazine and the Huffington Post, among other publications. She lives outside of Boston.